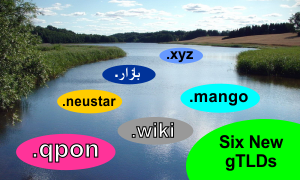 The Internet Corporation for Assigned Names and Numbers (ICANN) has approved six additional new generic Top Level Domains bringing the total number to 150. Within its New gTLDs Programm developed to increase competition and choice on the Internet, ICANN has announced the approval of six more new generic TLDs to soon enter the Internet. To find out more about registration of new generic TLDs, contact our Support Team at support@web-solution.eu or by telephone on +44 (0) 208 133 3994.